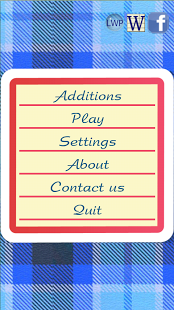 ‘Writewell’ is a spelling test game whereby users can play solo or in pairs to test each other’s knowledge. The app features multiple levels in the paid version however these levels need to be unlocked though top test results – so your spelling had better be up to scratch! This app has received an EAS Certification of 4 Stars. ‘Writewell’ is set upon the backdrop of a beautifully illustrated work book, the app itself has a simple to use interface and will not require any prior knowledge to begin to use> However, we would recommend this app to those age ranges who are competent spellers as the content can be quite challenging. 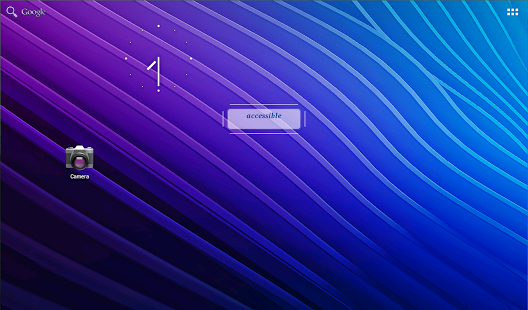 We must comment the font of choice for this application as it could affect the usability of the application. The default font is set to a scripture style hand written font which some users may find challenging to distinguish between the letter “R” and the letter “Z”, now wonderfully this is a setting the user can change to suit their personal preferences. This may also not be a problem depending on whether the user is well accustomed to reading hand written text. 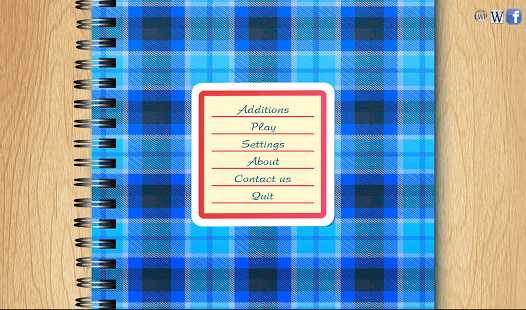 Another novel feature we found in the “Settings” panel is the ability to change or switch off the soundtrack played whilst in test mode; we particularly enjoyed the cheerful backing tracks. The ‘Game For One’ test features rounds of 20 questions where the user needs to indentify the correct spelling of particular words. 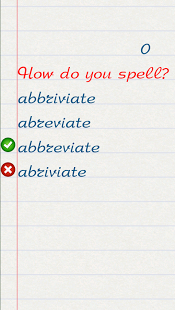 There are several types of feedback given in this application; firstly if the answer selected is incorrect, the correct spelling is then indicated. 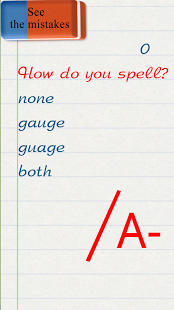 The next type of feedback given is a mark ranging from A-F. Once this test result has been given, the user can then check back through their test to indentify where their mistakes were. Once the user has selected which incorrect answer they wish to improve upon, the app brings up a definition from the Collins dictionary. This feature is useful to help gain an understanding of the word. The ‘Game For Two’ test is based upon the same structure as ‘Game For One’ however, in this mode, the users take turns to select which words they think are in the correct spelling. When the user has set up the app to hide the opponent’s selection, it can be a little hard to determine whether the app has registered player1’s selection and when it is the turn for player2 select. The feedback given once the ‘Game For Two’ test is complete is the same as in the ‘Game For One’. The additional competition offered by the game is great for incentivising learning. 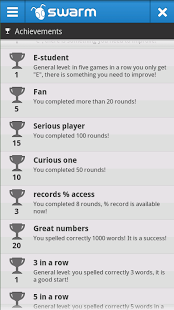 ‘Writewell’ incorporates an “Achievements” feature whereby users gain an extensive collection of awards such as “correctly spelt 3 in a row” or “first test completed”. This is a a good motivational feature as it also enables children, who are not performing particularly well in the tests, to receive another kind of reward for their efforts. Users can pay to have the advertising switched off in ‘Writewell’ however even when this is done the app still has external links though “Collins Dictonary’. However apart from that, this is an app which parents can feel comfortable letting their children use without adult supervision and the continual rewards and positive feedback will keep users motivated to learn further and improve their spelling. 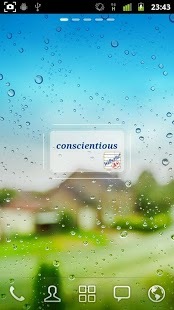 A solid app with educational value. 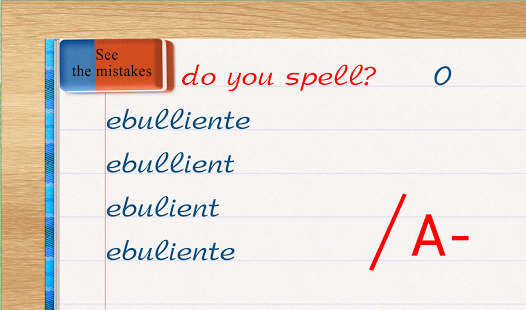 Are you sure you know how to spell English words correctly? 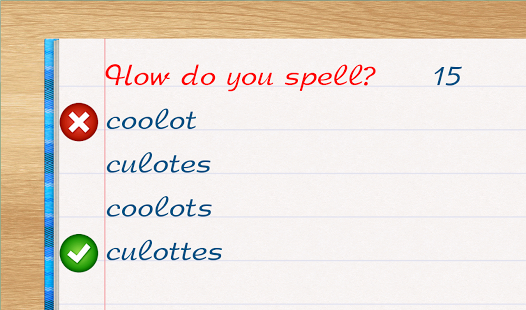 Check your knowledge with a new game "Wellwrite! ", a game for smart ones only! complicated to spell words of English language. Each round consists of 20 questions. 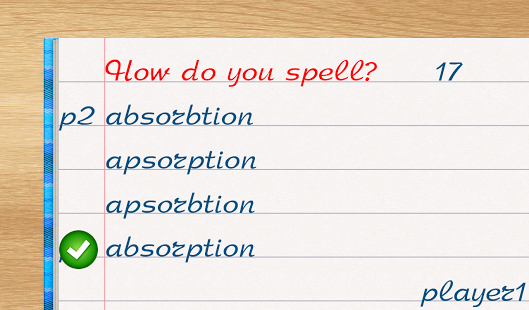 There appear 4 ways of spelling of a tricky word. You have to choose which one is correct. At the end of each round you will see what is your knowledge worth: from an A to F.
- correct your mistakes and a lot more! 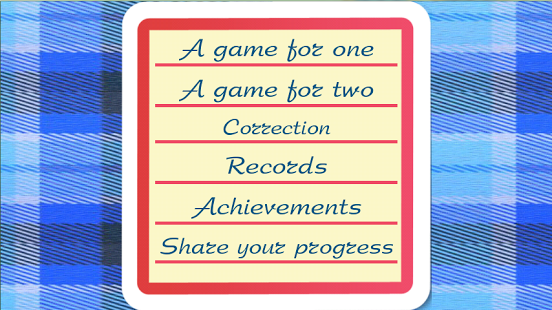 Improve your spelling skills, set records and compete with other players! Collect stars and medals and become the best! We will broaden your horizons and writing skills! The game creators used authoritative dictionaries of the English language.